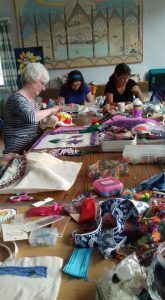 We are a group of craft enthusiasts who enjoy getting together once a month to share our ideas and skills. We started initially by meeting up in each others homes on a weekday evening but it was never enough time, we often didn’t have adequate space or light and it restricted our numbers. Our light and airy church hall seemed the perfect place for us to meet and in January 2016 we started our regular monthly Saturday group opening our doors to anyone who wishes to join us. We now meet every third Saturday from 11am-3pm in St Andrew’s Church Hall, access via Stewart Street. We provide tea/coffee and usually some home baking with our warm welcome. We have tried a wide and varied assortment of crafts including mosaics, chocolate making, silk scarf dyeing, crochet and patchwork. We take a short break for lunch (bring your own) about 1pm. We ask for a donation of £5 to cover the cost of materials and any surplus funds are given to support the ongoing refugee crisis as are sales of any items we have made. Unless otherwise stated we operate a drop-in approach so there is no need to pre-book a space and we supply all the materials required for the activity. Please visit our Facebook page to see forthcoming events and photos of what we’ve been making.